A man is moving towards the horizon, holding a cane in his hand. He carries a yellow bag on his right shoulder. He is dressed up like a pilgrim who would start a journey towards an uncertain road. Behind him an animal seems holding on to him. It may be a cat or a dog but the character does not give importance to this animal and follows his path, despite the obstacles that are before him. He seems going towards an uncertain road. 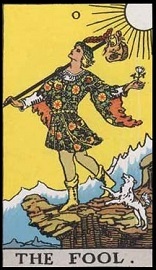 The Fool is often placed at the beginning of the cycle, and is the only major arcane that does not bear a number. The card represents a character still immature that would start his journey towards knowledge and wisdom. The Fool represents a beginning, the opening of a road. He is innocent, sometimes impulsive, and is guided by a spiritual force despite of the obstacles he meets. He tends to evolve towards something new and his current situation pushes him forward. The Fool can act without thinking and lacks distance to take the good decisions. He can also take arbitrary decisions, even if he risks regretting it later. The character finds difficulties in having a coherent reason and prefers intuition over rationality. You have to make a choice. Even if the consequences are blurry, you have decided to move forward and it could push you to reach your objective. Certain elements or certain people from your entourage sometimes try to prevent you from acting but success seems to animate you. Nevertheless, beware of the unforeseen because the Fool character can be impulsive. Try to pay attention to the obstacles on your path because indolence can lead to the worse situations. Try to remain coherent in your decisions in order to be more mature. The Fool indicates that you have the solution to your problem but that you have to help the others understand you. If the action can seem vague or confused, trust your intuition and move forward. To reach the result that you are expecting, count on your determination and keep in mind your objective. The Fool announces a fresh start. If you are determined enough to reach your objective, meaning facing the different obstacles that you will meet, you will meet your goals. In order for it to happen, be self-confident and do not lose hope. If your future seems blurry it is because the situation you are about to confront is new. This does not mean failure. Stay vigilant and show patience, beware of your free will as many paths are still wide open. You will start something new which still seems vague in your mind. You are facing unpredicted things and you do not know which road to take. The Fool can bring doubt on the success of your situation. Try to show pragmatism and keep your objective in mind. You have great qualities that will clear hazards, risks and doubts, in order to bring you to a more comfortable position.